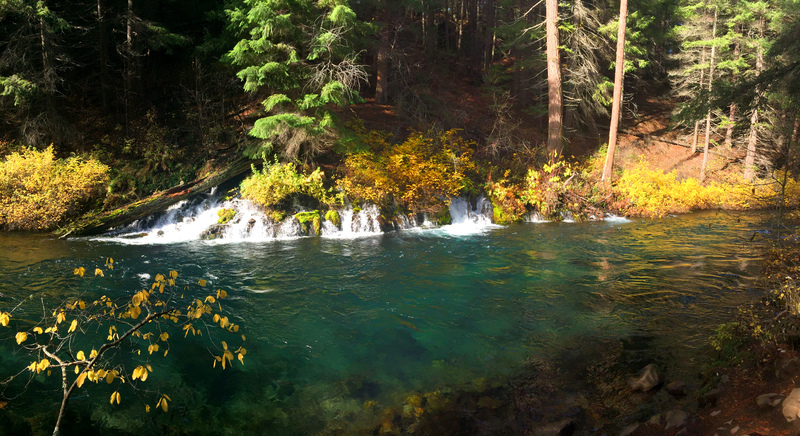 A crisp, sunny fall morning was perfect for a leisurely hike along the Metolius River, which magically emerges from a spring just south of Camp Sherman in central Oregon and flows nearly 30 miles before entering Lake Billy Chinook. We were among the first visitors to the Wizard Falls Fish Hatchery on an early Saturday morning in October. We toured the hatchery grounds a bit, marveling at the fish and watching them swarm the pellets we fed them. And then we headed to the trailhead, located adjacent to the visitors parking lot across the lane from the hatchery. For the two miles from the hatchery to Gushing Springs, we had the West Metolius River Trail practically to ourselves. The well-maintained and generally flat trail stays within view of the river the entire way. At times, it’s right on the river bank; at times, it’s slightly uphill from the river. But there are gorgeous sights the entire way. A sign at the hatchery said the river stays at a fairly constant temperature of 50 degrees year-round, thanks mostly to its spring-fed origins. Plenty of fishermen were getting ready to test their luck on the river, which was prominently marked for fly fishing only. At the Head of the Metolius, roughly 6 miles south of the hatchery, the river flows from the hill-side springs at the rate of 50,000 gallons per minute. It’s an amazing sight to see forest understory at one point and a full-flowing river just yards away! And Gushing Springs, its white water flowing from the springs, surrounded by the yellows and greens of the fall foliage and making the short drop into the blue-green pool of the river, was one of the prettiest sights we saw all weekend. Following closely on the heels of our most recent organized trail runs, we made a leisurely hike out of the 4-mile round trip. But the trails could easily be run instead of hiked, and a trail on the opposite bank could be added in for a 6.5-mile loop. From the junction of Highway 20 and Forest Service Road 14, follow the Forest Service Road north just over 10 miles to the Wizard Falls Fish Hatchery. Cross the Metolius and park in the visitors parking lot. The trail begins on the south side of the parking lot. Staying there: We camped in the Eurovan at the Forest Service’s Smiling River Campground, about 4 miles south of the hatchery. It is one of several Forest Service campgrounds in the area, and there are a couple of private campgrounds in Camp Sherman, too. Smiling River had pit toilets and water hydrants. In October, the campgrounds were all just one-quarter to one-half full, and we got our choice of riverside spots. I would guess that all the campgrounds are very busy in the summer. Cost was $14 for the night. Gushing Springs emerges from the hillside about 2 miles south of the hatchery. Cool video. I wanna be there.